Now Offering…Coupon Match-Ups for Target, CVS, Walgreens and More! Two weeks ago, I shared about the new Grocery Nation coupon-matchup mobile app that is currently available in Android for those living in Ohio and Indiana. There is a fabulous new feature here on $5 Dinners that isn’t limited to OH and IN. Sorta. We are now offering coupon matchups for the following stores. Some of these stores are “local” to the OH and IN region, and others are national stores. What’s a coupon matchup, you ask? A coupon matchup is what you see pictured above. It’s a list of all the items that are on sale each week at that particular store (both displayed in the circular, as well as unadvertised deals), paired with the current coupons that are available in newspapers, magazines or printable from online. The matchups allow you to see the lowest, rock bottom prices for products each week. 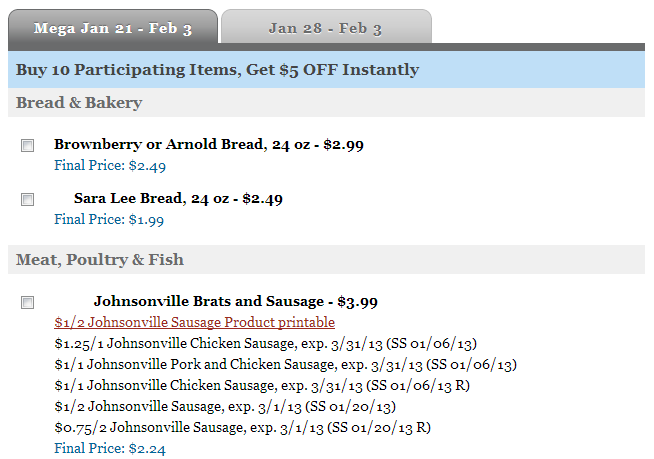 They also allow you to follow sale cycles, stock up when items are at their cheapest price point, and save…save…save! Now, head on over to the Grocery Coupon Matchups page to get started! P.S. We will be reminding you when the stores and prices have been updated each week, so you’ll never miss a deal! P.P.S. And if you have an Android phone and live in OH or IN…you MUST get the app downloaded ASAP! P.P.P.S. If you have an iPhone and are in OH/IN, leave your email address so you know as soon as it’s available. And if you are in another region, leave your email too…so you know right away when it’s available in your market!